“You still haven’t seen Notre Dame’s west facade,” we tease my dad. 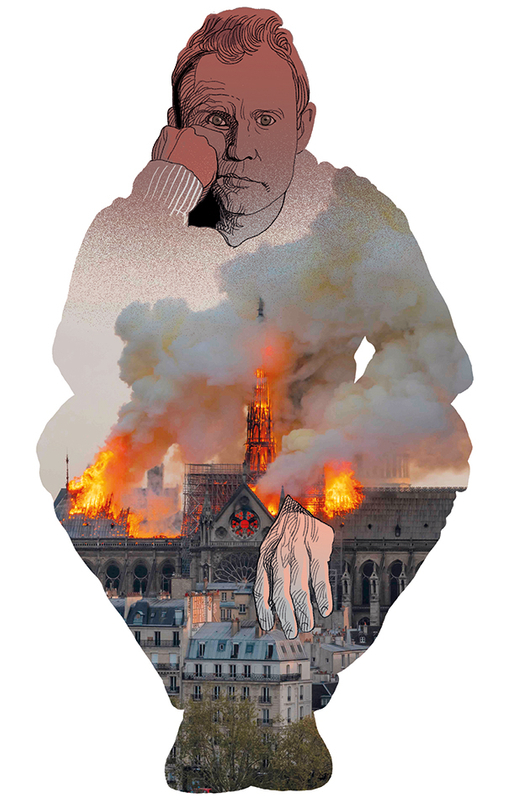 The first time my mum, an art historian and Gothic architecture obsessive, took us to Paris’s iconic cathedral, the front was covered in scaffolding, as workers were painstakingly removing years of accumulated grime, turning the brooding, dark grey stone so many shades lighter that it almost seemed white. My mum, my sister and I visited the lightened edifice years later. My dad had to work. We rub it in. Uncovered were the 28 kings of Judah, standing in a dramatic row on the cathedral’s facade. Mistaken for old French monarchs, the statues were beheaded and removed during the tumult of the French Revolution. New versions were installed in the 19th century. Human ingenuity built Notre Dame. Human folly has marred it. Human reverence for the old and the beautiful has rescued it — before, anyway. We walked on the roof to observe the church’s profuse decoration more closely. That tall, grey roof, where the nave and transepts once crossed, led to the building’s ornate spire, supported by increasingly delicate arches with their characteristic Gothic point. The centuries had turned the rooftop’s statues bright green, the sign of copper that has been thoroughly oxidised. On Monday, another unstoppable chemical reaction engulfed the roof — and who knows how much more of the structure. How much exists now only in memory? “Stunned and heartsick,” my mum texted me on Monday afternoon. The spire is gone. 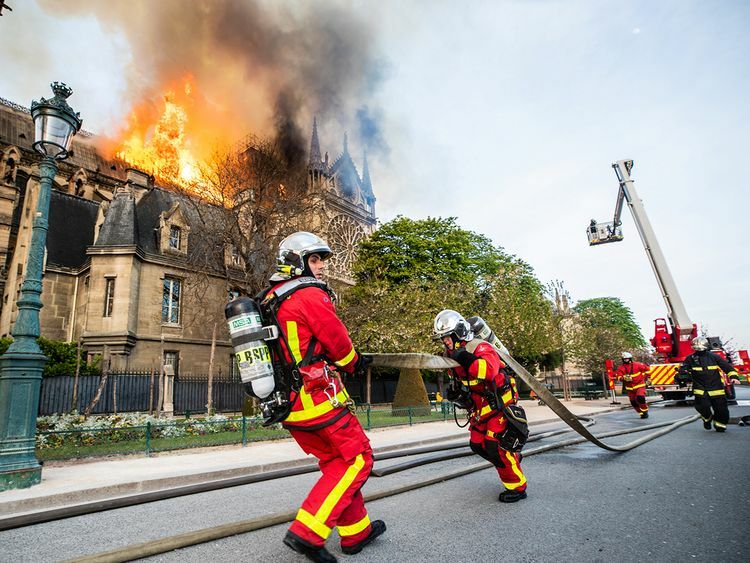 French officials gave varying accounts of how much damage the fire might do. Why do humans react to the destruction of old things with such emotion? Daesh’s brutalisation of the ancient city of Palmyra evoked as much or more sorrow as the deaths of countless Syrians. The looting of ancient Mesopotamian treasures became a symbol of post-US invasion anarchy in Iraq. Yet, we also like its oldness. Old buildings symbolise the notion that not everything must end. This is the promise of many religions, a hope that centuries of worshippers who gathered inside Notre Dame shared. But even fervent atheists can feel the desire for continuity in a vast and ever-evolving universe that seems indifferent to them. When old things burn, we restore them, even if those are not the real 28 kings. This makes a place such as Notre Dame an ambivalent monument to persistence. It is a collection of additions, restorations, replacements — each representing humanity’s unwillingness to let this piece of history erode away. Who’s to say it was right to remove the stone’s grime, changing the colour from the one living Parisians already knew — and preventing my dad from seeing the west facade? The drive to make the building, at once authentic and inauthentic, seem like a firmer connection to the past made it worth the effort. Notre Dame is not dead. The cathedral will rise again. It will be beautiful once more. The spire will be as delicate. But somehow the cathedral will not be quite as alive as it once was. I did not realise until Monday how much I was looking forward to taking my future children to Notre Dame and pointing at its incredible rose windows, the same ones whose reds and blues I marvelled at when I was 11. I would have told them how Middle Ages artisans could manipulate the chemistry in just the right way to produce such deep colours, almost like magic. Or maybe I would have had to work, and they would have made me regret that I was not there to share that moment with them. Stephen Stromberg is a prominent American writer who specialises in foreign policy and politics.